Want to bring a friend for free in the month of October? 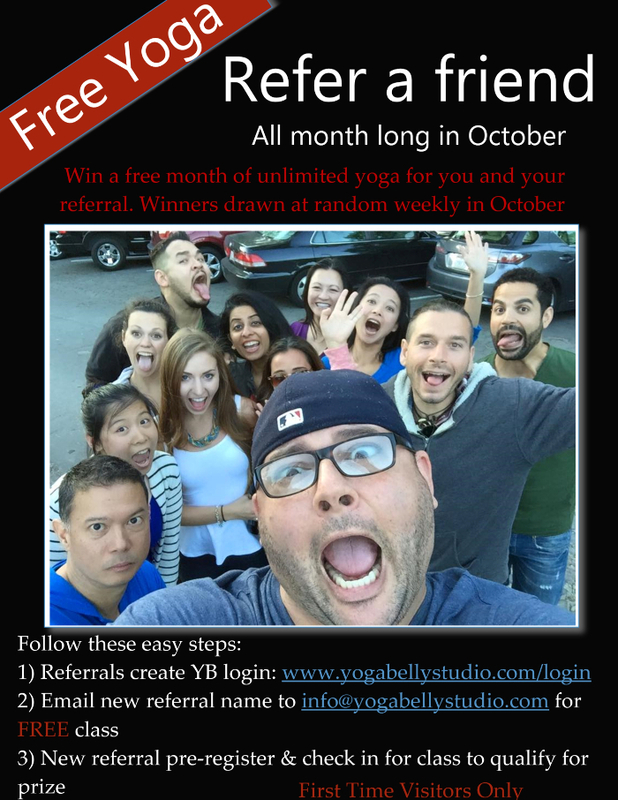 October is refer a friend month at Yoga Belly. Simply follow the three easy steps and you will be entered into a pool to win a free month for you and your friend at Yoga Belly. This promotion is for first time visitors only. If you have any questions please reach out to us at info@yogabellystudio.com. Valid October 1, 2015 through October 31, 2015. Winners will be announced on social media October 8, 15, 22 & 29.
https://yogabellystudio.com/wp-content/uploads/2017/09/Bring-a-friend-in-October-scaled.jpg 906 700 Aaron Goodnow https://yogabellystudio.com/wp-content/uploads/2017/09/logo_340x156-1.png Aaron Goodnow2015-09-29 19:58:032017-09-29 20:15:13Want to bring a friend for free in the month of October?